When setting up a second email address for a vendor the app was not able to update the vendor record. I tried this several times. When you review a vendor record and expand several sections and than click on the edit button the same sections should be expanded on the edit-screen and the screen could show the same section you were reviewing before (so the user does not have to scroll down again)? The country dropdown under “Contact people” -> “Address” is not working for me. I cannot choose any values. Does the URL for a contact person need to be mandatory? [Hmm, not sure it was meant to be mandatory, but I see that it’s throwing a message that it is. We will investigate. Also, I think we need to mark the mandatory fields with an asterisk, to help folks know what must be filled out before receiving a string of “required!” messages when they try to save. For OH interfaces it would be useful to note the coordinator for the interface account. Every user has their own login so only displaying one might be confusing in this section. The coordinator is the person from the institution who has the permissin within our systems to set up a new user or assign additional permissions. I hope this is somewhat useful. Let me know if you have any questions. Hi Sebastian - thank you so much for all this feedback! Please see replies interspersed above. Here’s more background on the FTP section (which is a subsection of the EDI section) - let me know if additional questions. Keep in mind that for v1, FOLIO will only support EDI orders and invoices. Username & Password: Assuming there’s a logon once you contact the FTP server, what is the library’s logon? 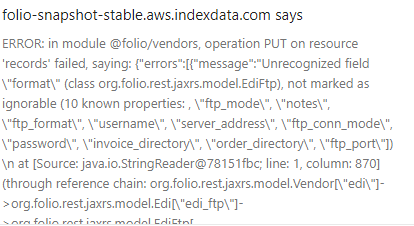 Order/Invoice Directory: once logged on to the FTP site, if orders are stored in a subdirectory instead of the root directory, specify the subdirectory. That way FOLIO can change to the proper subdirectory to place orders or pick up invoices. Scheduling: If you want to schedule orders to be sent or invoices to be checked at a specific time, use the scheduling section. There’s also a “check now” button in case you want to look for/download any new invoices immediately. Notification Options: If someone at the library wants to receive an e-mail when any EDI transactions happen, or only when specific EDI transactions happen, they can use the Notification Options section. thank you for editing this post and taking care of our feedback. To my mind, the vendor app is great and easy to use. I agree to @annikadomin, that being able to search for a contact name would be great. Then I had the same problem as @Sebastian in selecting a country for contact people. Same applies to selecting a default language for contact people (although both required). In almost every section you can “add” information which is great. Is there a limit? When you ask for a claiming interval (vendor information), could you add that this is entered in days (in a former system we would have entered the number of weeks)? This is just a bagatelle, but in the filter section, there is a typing error in “technical support”. I asked some colleagues for further feedback and will let you know what they think. Hi Martina - thanks so much for your feedback! Please see above for comments interspersed. Hi Ann-Marie! Thank you for your answers. Were you updating an existing vendor or adding a second e-mail address to a new vendor? and I do not remember a 100% but I think I was playing arround with the exsting accounts.So this problem has most likely already been caught. You are right. Using the notes field should be sufficient for the coordinator info. And if the majority of platforms only use one login per institution it does make sense to have the field setup as it is. My problem with the display was more related to the FTP scheduler where you can set specific days of the week to collect files from the vendors ftp-server. I am sorry for not being more specific. The setup display seemed all right but in the vendor overview display all weekdays showed up in a more or less unstructured manner. Again, unfortunately I cannot login today to make a screenshot of it. I will let you know if I can reconstruct the problem. My problem with the display was more related to the FTP scheduler where you can set specific days of the week to collect files from the vendors ftp-server. I am sorry for not being more specific. The setup display seemed all right but in the vendor overview display all weekdays showed up in a more or less unstructured manner. Ahh - I understand now - the scheduler part needs some refinement to make it more clear. Will add that to the list. Thanks for the clarification! Stacks has confirmed there is currently no limit, and no plans to impose limits unless a reason surfaces in the future. Thank you again for all of the feedback on the vendor app (so far). We reviewed it all this afternoon, and Dennis is entering a number of these as bug fixes and enhancements in Jira. There’s a few we’ve flagged for more discussion, since they are larger asks or may be tied to FOLIO-wide efforts such as bulk editing or exporting of search results. Stay tuned for more info from Dennis next week. Hope everyone has good weekends! The vendor app has all of the fields we currently use as well as a few more. We added a new vendor and deleted it with no problems. We had the same problem in the contact name section with country as there were no countries listed and it would not allow you to type. [Note: Ann-Marie has addressed this in additional Discuss posts since these notes were written]. I [Deb] created EBSCO as a new vendor. I then thought I would add the EDI information and did not have any problems. However, when I tried to add the FTP information I received the error box below. What is the ERP code? [Virginia note: I know we have discussed relabeling/renaming this field, but I thought I’d note that our staff weren’t able to figure out what ERP stood for]. We also were wondering about if the default language could be changed to English. [Note: Ann-Marie has addressed this in additional Discuss posts since these notes were written]. The selection from the list should be made more intuitive, regardless of whether only one category or several categories are selected. Before saving, you should be able to see which selection was made, for example by listing the categories again individually. The arrows for selecting a country type just show 1 to -1. What is the purpose of thoose arrows up and down? It’s a bit time consuming to select the default language for almost every field, again and again. Could a library select a language as default so you won’t need to select it anymore (only if the language differs from the standard)? We also have some more feedback now from the staff who will be working with the app. Will it be possible to link/refer to/identify contact persons? Will they have an ID of their own? It might be useful to link to them from other app contexts. Or (the other way around), if there might some day be a kind of “contact persons app” - might the contacts added there be referenced from the vendors app? Maybe vendors and contacts could be slightly more seperated. Maybe vendors and contacts could be slightly more seperated. Please see above for comments, interspersed. This current structure will be the format for the first iteration of vendors and contacts. I believe the intention is to make this richer and more separated in subsequent iterations. In the future, if we have an Organizations app and a Contacts app, then we’ll be able to link contacts to specific organizations. That way, when a contact moves from one organization to another, you can keep the basic info about the person, but change their organization, phone, e-mail, etc - kind of like LinkedIn does for people and the organizations they work for. I’ll also add: an Organizations app could also be helpful for showing relationships between organizations, e.g. divisions or subsidiaries withing a larger company. Right now the vendor app is a flat structure, with no way to show hierarchy between different vendors. However you can relate vendors to each other by adding AKA names or notes. For example if you had separate vendors for EBSCO Subscriptions, Flipster, EBSCO Information Services, and GOBI Library Solutions, you could retrieve them all at once by putting in “EBSCO” as an AKA on each of the separate vendors.